There are a number of Prolific Serial drivers and these have been listed below. There is also an explanation here (USB to RS232 Driver) which also uses a Prolific USB driver. If the Prolific USB to serial drivers below do not work then see the USB to RS232 driver for more information as it uses more than one option. There is also an installation diagram ( FT232R USB UART Driver) which shows how to install and remove USB drivers on your computer. 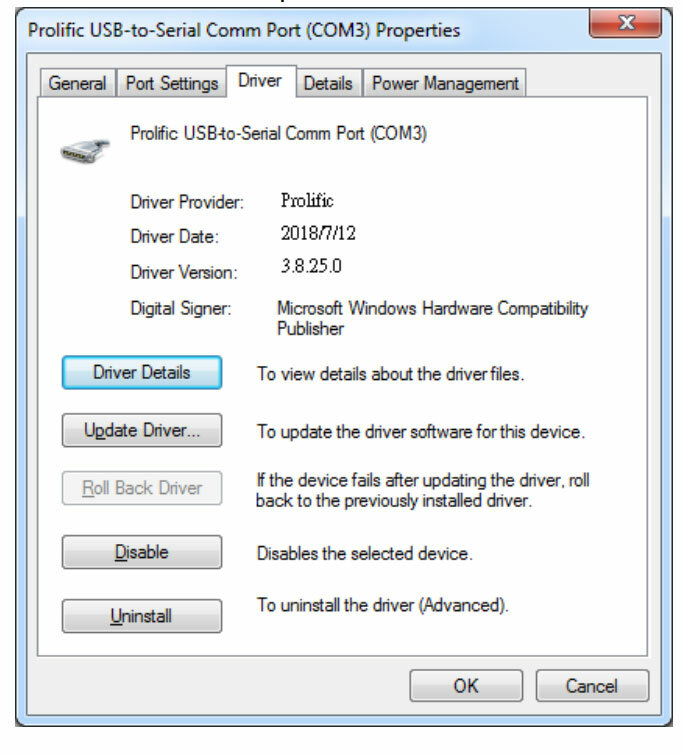 Note that we have updated the Prolific driver for the Prolific USB to serial driver which you now download below for Windows XP/7/8/10 listed below. Now close the installer program when it is installed. 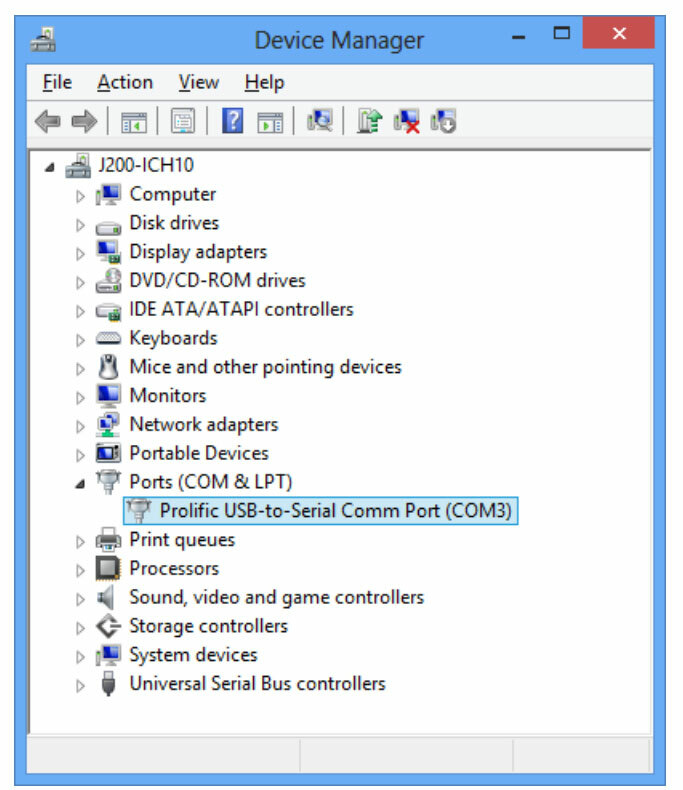 Check the “Prolific USB-to-Serial Comm Port” driver version by right-clicking on the Prolific Port and then click on “driver” on the top to check the driver version that you have on your computer. The Prolific USB to Serial Driver date will show below as is shown on the picture below. If you get an error that the Prolific USB to Serial Adapter is not working then you will need to uninstall the driver on your computer and remove the Prolific USB to Serial adpater from your computer. Report and connect the Prolific adapter again and then wait until it looks for the Prolific USB to Serial driver. Direct the software to where you extracted the driver to and install the Prolific driver from there. 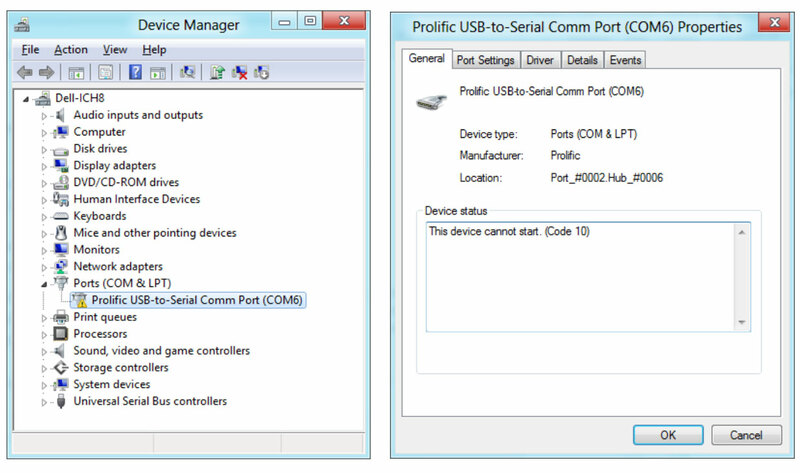 You can change the port settings on the Prolific USB to Serial Adapter settings as shown below. You will need to click on the port options on the top of the menu and then click on the advanced options which holds the advanced port options on the Prolific adapter as shown below. This is the Idle Timer for the PL2303 chip to enter suspend mode and the default for this is 10 seconds. You can change this on the Prolific USB to serial adapter. Check your chip as this does not work on the PL2303SA chip. Also note that for the PL2303HXD/EA/RA, you need to write to OTPROM first. By default this is enabled. This will disable the DTR/RTS pin initialisation signal during driver load to disable the serial mouse or modem from being detected. Check this setting if your Prolific USB driver is not detecting your serial modem or serial mouse. The Prolific USB to Serial Adapter normally has this enabled as stated before, however for troubleshooting it is always best to check the advanced settings. The signal needs to be enabled as the default for this setting is TTL=HIGH as well as RS232=LOW. This is very important if you have many devices. The default for this settings is enabled. If you check this it will ignore PL2303 device Serial Numbers. If you disabled this then each PL2303 device even with different USB serial numbers will be treated as same device. This is more for troubleshooting your serial devices. This will set the buffer size of the serial device. The default settings for this is 4096.